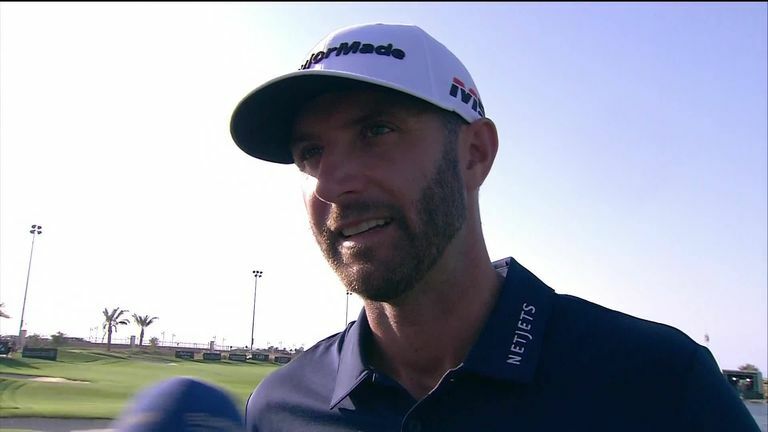 Dustin Johnson admitted he had to battle hard to get the better of a world-class field as he reflected on his first victory in a regular European Tour event at the Saudi International. Dustin Johnson is heading into "a big three weeks" full of confidence following his impressive two-shot victory at the Saudi International. Johnson admitted he made it difficult for himself to close out his first win in a regular European Tour event when, armed with a two-stroke advantage with three to play, he pulled his tee shot to the short 16th into the ocean to open the door for playing-partner Li Haotong. The world No 3 took his penalty drop and still had 154-yards to the hole, but he knocked a brilliant wedge to 10 feet and rattled in a crucial putt for bogey, and a high-quality two-putt from just short of the green at the 17th saw him reclaim his two-shot buffer going up the last. Johnson never looked likely to buckle on the long 18th as he comfortably reached the green in two to set up his fifth birdie of the final day for a round of 67 and a winning score of 19 under par, and he can now look forward to a busy stretch of tournaments with renewed optimism. "I'm heading back to the States and I've got three big weeks in a row, I've got Pebble, LA and Mexico coming up," said the champion afterwards. "To win here shows my game is obviously in good form, and I'm heading into three really big weeks for me. "To have a lot of confidence going into those three weeks is a good thing, and they are three places that I've had a lot of success at so I'm hoping to continue that going into next week and on for the rest of this year." Johnson trailed Li by one at the turn before the Chinese challenger bogeyed three of the next five holes while the world No 3 hit back from a dropped shot at 10 with back-to-back birdies - his tee shot at the short 11th pulling up just inches from the cup. "It was tight, but I made nice birdies on 11 and 12 and then I made it a lot closer at the end than it should have been by hitting it in the water on 16," Johnson added. "It was a good number to hit for the shot I was hitting, I just pulled it a little bit. It wasn't off by much, it was just barely left. "But to stand up there and I've got to hit pretty much the same shot again, and to hit it in there close and make the putt was definitely the momentum hanger for me that I needed after hitting it in the water there. I needed to make that putt just to stay ahead by one, but I knew I still needed to birdie 17 and 18 if I wanted to win. "It's great to come here for the inaugural event, and I'm very honoured to be the champion. I've got some really good friends who are very involved with this golf tournament and kind of made it happen. When they were talking about with me a little over a year ago in Abu Dhabi, I told him I would come play. "It's a big win for me. I think the event went off fantastically, and I enjoyed the golf course. Obviously I played it very well. I really enjoyed my week this week, and I hope to be back next year." Li had to be content with outright second after he birdied the last to edge ahead of Tom Lewis, and he conceded that Johnson was a worthy winner as he reflected on his erratic back-nine performance. "I was just a little bit off, and I wasn't at my best," said Li. "But I learn a lot and especially that last few holes was good for me. I think he deserved to win this event. When I had four holes left, I looked at the leaderboard and I had dropped to third place, so I was very happy to finish solo second this week."